Increases productivity by increased AutoTrac usage in subsequent cropping passes. Higher accuracy of placement of inputs improving crop potential. The goal of all producers is to have inputs, such as seed or fertilizer, placed into the ground in the most accurate way possible. With the increasing cost of inputs and adoption of farming practices that need precision, such as strip-till applications, accuracy at the implement has become increasingly important. AutoTrac™ Implement Guidance helps maximize the use of inputs by increasing accuracy and repeatability at the implement thanks to a second receiver on the implement. Having a second StarFire™ receiver located on the implement allows the tractor to guide the implement through the field with additional accuracy, even on curved passes and sloping terrain. AutoTrac Implement Guidance (passive) commands the tractor to the correct location to keep the implement on the guidance line. In applications utilizing AutoTrac Implement Guidance, seeds are more consistently placed to take full advantage of pre-applied nutrients. This level of precision allows implement guidance to reduce overall input costs. The implement position and a consistent guess row, or the row between implement passes, has to be accurate in many growers' operations. With differential corrections accuracy is at the tractor , due to implement drift accuracy at the implement could be reduced. Improving pass-to-pass accuracy improves operation-to-operation accuracy. This increases the ability to use the AutoTrac™ system on subsequent passes and can increase the ability to use implements with different widths on the same field. When improving accuracy on the first pass, like planting or strip-tilling, operators will increase the ability to use AutoTrac in subsequent cropping passes, like spraying or planting following strip-tilling. AutoTrac Implement Guidance increases the ability for more consistent guess rows, reducing overlap and improving placement of inputs. Performance when using articulated tractors may vary. When using AutoTrac Implement Guidance in curves, the operator may need to make adjustments to the curve sensitivity setting to improve accuracy. This setting can be found in the Steering Optimization settings, as seen below. 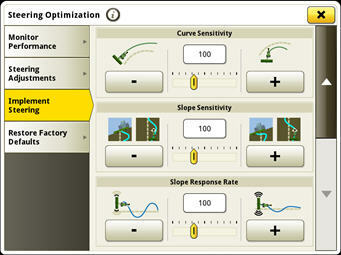 Adjustments up or down, depending on the curve performance, will improve accuracy of implement placement. Active Implement Guidance or AutoTrac Implement Guidance (Passive) allows operators to be more productive as they focus on tasks other than steering while traveling though the field. 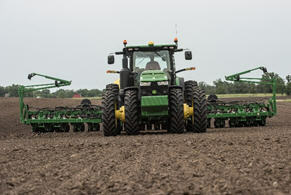 Active Implement Guidance pairs up with an implement steering mechanism, which allows both the implement and tractor to stay on the same guidance line. This system is optimal for applications in standing row crops, like side-dressing application of nutrients, in addition to first-pass operations like planting and seeding or strip-tilling. 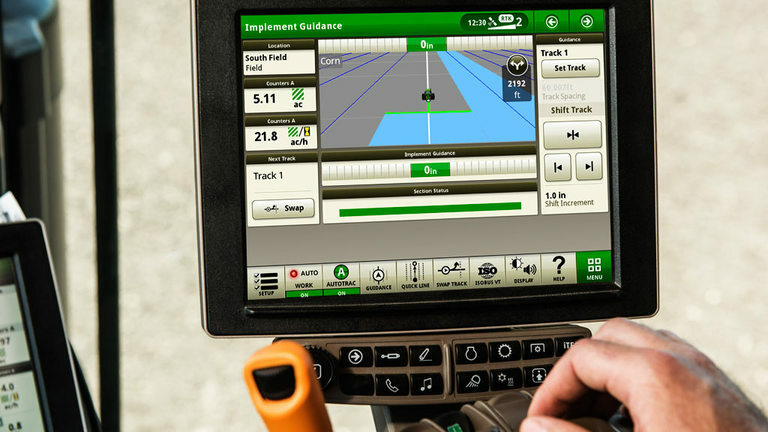 Active Implement Guidance is available using the 1100 Application Controller for both GreenStar™ 3 and Gen 4 4600 CommandCenter™ and 4640 Universal Displays. For additional information on Active Implement Guidance, please refer to the Active Implement Guidance section in the Ag Sales Manual. AutoTrac Implement Guidance (passive) allows the tractor to travel off the guidance line while keeping the implement on the intended path or guidance line. There is no implement steering mechanism needed because of the ability of the tractor to travel off of the guidance line. This system is optimal for first-pass applications like pre-season nutrient applications, tillage, planting and seeding, or strip-tilling. It is not recommended for applications in emerged crops or when planting in strip-till applications. AutoTrac Implement Guidance (passive) is only available on the Gen 4 4600 CommandCenter™ processor v2.0 with CommandCenter Automation 3.0 activation or 4640 Universal Display with Automation 3.0 subscription and the 19-1 software update.